Not so long ago, when Australians moved overseas, they were forced to leave behind the game they love. Fortunately that is now changing, and Jeremy Blyth is someone who has benefitted. And since he spent several teenage years in New Zelaland, he hopes to represent them with pride in the 2005 International Cup. Blyth moved to New Zealand but has returned to Australia to play with Queanbeyan in the AFL Canberra. World Footy News recently conducted an interview with him via email. WFN: Thanks for talking to us Jeremy. I've heard you were born in Australia but have been playing footy in New Zealand until recently. So how did you end up in New Zealand and how old were you when you went there? Do you consider yourself more Aussie or Kiwi, or both? Blyth: G'day World Footy News, I was born in Launceston, Tasmania in 1986 and moved to New Zealand at the end of 2001, I moved there as my father had gone to live there in 1999. As for my Nationality I am an Aussie, nothing can change that, but an Aussie with very strong ties to New Zealand. WFN: How old were you when you first started playing in New Zealand, and who was it for? Blyth: I started playing in New Zealand when I was 15 for the University blues, which is an Auckland based team that plays in the Auckland Australian Football league. I have played two seasons with them in which we have won the premisership on both occasions. WFN: Were you surprised when Queanbeyan in Canberra offered you a scholarship? What exactly were you offered? Blyth: In April of 2003 New Zealand put together an under 16 national team to compete in the Jim Stynes trophy, later changed to the Ron Barrasi cup, to be held in Canberra. We competed against two NSW/ACT sides and a Nauran side which we won undefeated. Queanbeyan, a club which competes in the ACTAFL offered me the chance to come back and play for the remainder of the season. The Queanbeyan Tigers offered me 50 grand to come and play, but we settled on accomodation and a couple of plane tickets instead. 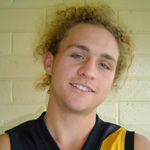 WFN: My understanding is that you played in Queanbeyan's Under 18s in 2003 and won the best and fairest. Is it correct that you stepped up to reserves this season? How has that gone? Blyth: Yeah the best and fairest was a real shock to me when I found out, I hadn't arrived at the club until round 7, so anything like that was a very pleasant suprise. This year I am playing reserves which is going along very nicely, we are only two weeks away from finals and we have only dropped two games all year which puts us in second spot on the ladder which means the double chance. WFN: There was a rumour you were offered to have a game with the Sydney Swans' reserves earlier this year. Is that true? Blyth: Yeah the Swannies field their reserves side in the ACTAFL, so the chance to have a game with them when they had a few regulars missing was an oppurtunity I took with wide arms. I only found out 2 nights before the game, so the nerves didn't have too long to brew, but I was very pleased with the way I played and it was alot of fun. WFN: What position have you been playing mostly lately? Blyth: I spend most of my time along the back flank or the wing, but with the style of play that the Tigers have there are still plenty of oppurtunities to kick goals and get plenty of the ball. WFN: What are your ambitions - do you rate yourself any chance to make the AFL one day? Blyth: I am very happy playing where I am at now, I have good balance in my life between work, friends and football. To take the next step would probaly mean for me sacrificing a few things that I am probaly not ready for. But in the future things may be different. WFN: There have been a few other players from New Zealand offered chances to play footy in Australia this year. Do you know much about how they've been going? Blyth: There is another guy from Wellington playing at the Tigers this year in the under 18's (Nathan Rose), he's going well and has learnt a heap from being here this year. As with all Kiwi's you can never question their endeavour but the late introduction to the game can sometimes put them on the back foot when they are playing against guys that have been playing since they could walk. WFN: Are you hoping to play for New Zealand in the 2005 International Cup? Has there been much talk about that amongst the Kiwi players? Blyth: The 2005 International Cup is a real goal for me at the moment, after the end of the season here that will be my main focus. The New Zealand Falcons had great success at the last cup, but New Zealand going from strength to strength they will be a red hot favourite next year I'm sure. WFN: Thanks very much for talking to us, and good luck with your footy wherever it takes you.